On July 29th, Greenpeace dangled climbers from a bridge and staged a maritime blockade of the harbor in Portland, OR to detain Shell's icebreaker Fennica in port, where it had stopped for repairs. The blockade was selective, the climbers raised themselves to allow all other ship traffic to pass. On the 30th of July a Multnoman Co Sheriff's boat rammed through the kayakers in the water and the Fennica ran the blockade and escaped. At least one kayak was run under the police boat's bow. The Fennica is carrying the capping stack without which Shell is not permitted to drill into oil bearing rock strata in their offshore Arctic drilling program this summer. If it is stopped, so is Shell's drilling. 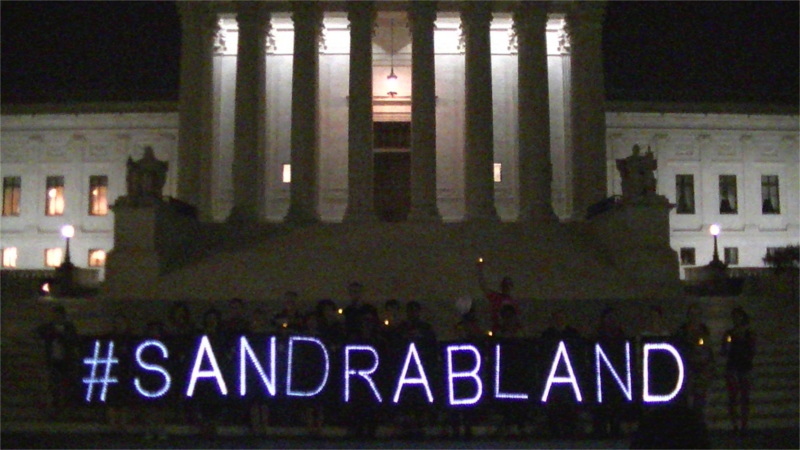 On the 28th of July, the Light Brigade deployed lighted letters at the US Supreme Court and US Capitol to remember Sandra Bland. Police in Texas arrested Sandra and held her in jail for defying an illegal order from a cop at a traffic stop to put out her cigarette-in her own car. Three days later she was found dead in her cell with a noose around her neck. Some say she was lynched, certainly hanging is the very symbol of lynching. Sandra's mother has said "this means war" at her daughter's funeral. Her family and friends say there is no way she would have killed herself. In Rockville, MD, a statue of a Confederate soldier sits outside a courthouse. Courthouses are one of the most important places people of color face systematic abuse, getting different "justice" than whites get. The Confederate statue outside is a symbol of the racism inside. 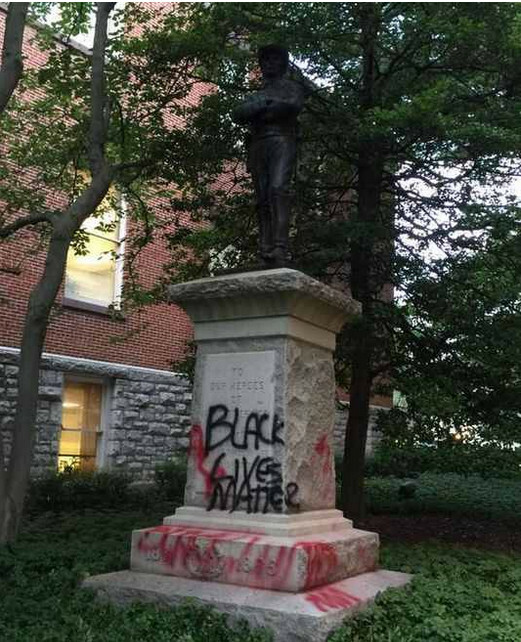 On the morning of July 27, the words "Black Lives Matter" were found painted on the statue. County Executive Isaih Legget says the statue will soon be moved but no decision has been made on where. County officials were so fast to have the truth power-washed from the statue that only the original photos by an Uber driver clearly show the artist's work. This photo was run on CBS TV9's website but credited to "? @nutzarieus," their own photos showed the remnants of the graffiti after the county hurredly tried to whitewash away the words "Black Lives Matter"
In response to The Intercept’s FOIA request, for example, last month the DHS’s Office of Operations Coordination released over 40 pages of documents (archive 1, archive 2) detailing live updates and Google Maps images of Black Lives Matter protestors’ movements during an April 29th protest in Washington, DC. On the evening of July 23, DC Stampede visited Mongomery Villager, MD, home of Martin Sharpless, VP of Skanska USA Building. They found most of his neighbors disapproved of his company's work at University of Washington (state) building a new vivisection laboratory. 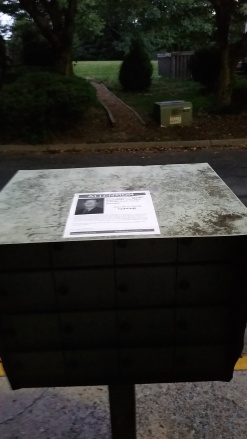 Four signed letters asking him to drop the contract. 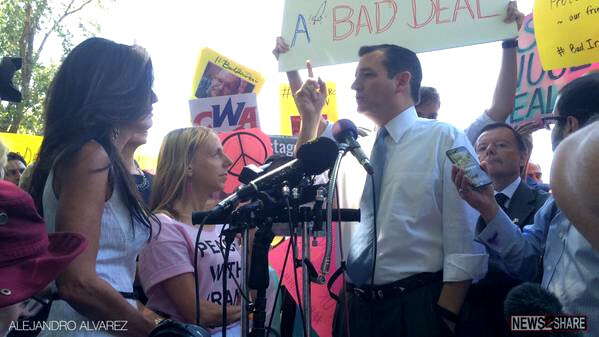 On the 23rd of July, Ted Cruz spoke at a right-wing rally opposing the nuclear deal with Iran staged by "Concerned Women for America" in front of the White House. Another, more progressive women's group showed up to oppose him. Code Pink managed to get in Mr Cruz's face opposing his message of hate and refusal to negotiate, Concerned Women for America is a group that was known during the 1980's for anti-Gay protests, so for Ted Cruz to appear at their rally is a message of support for anti-LGBTQ bigotryt on his part. On the 22nd of July, Apache Stronghold rallied in front of the US Capitol to demand passage of HR-2811, the Save Oak Flat Act. This act would reverse the late-night addition of the "SouthEast Arizona Land Exchange" to the 2015 National Defense Authorization Act(NDAA). 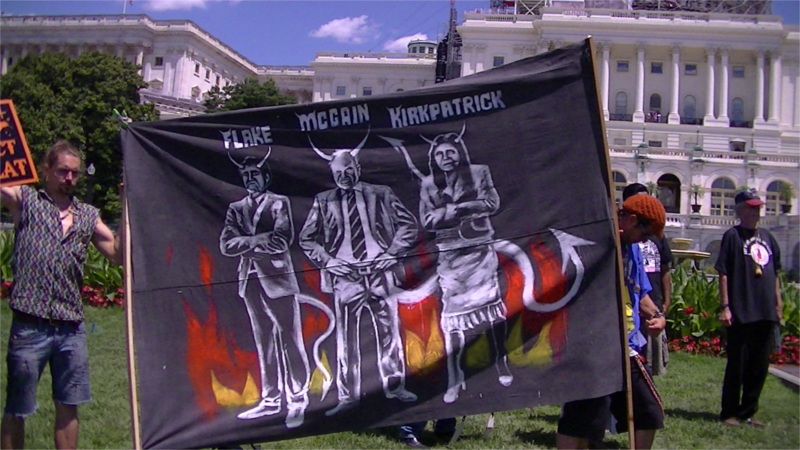 Three politicians instrumental in addding this totally unrelated rider to transfer sacred Apache land to Resolution Copper LLC for a destructive copper mine to the NDAA were singled out by name and presented as devils in a banner. They are Senators John McCain(R-AZ), Sen Jeff Flake(R-AZ), and Rep Ann Kirkpatrick(D-AZ). Update 7-22 10PM: After the rally, grandmothers and young women were threatened with immediate arrest and "escorted out" of the House office buildings after including Rep Paul Gosar in their visits to members of Congress. He hid behind a locked door and demanded Capitol Police remove all Apache people immediately. Apache Stronghold calls out Sen John McCain, Sen Jeff Flake, and Rep Ann Kirkpatrick for slipping the mining deal into the 2015 NDAA. On the 21st of June, Apache Stronghold marched into DC for a series of events demanding that a copper mine planned for Oak Flats be cancelled. 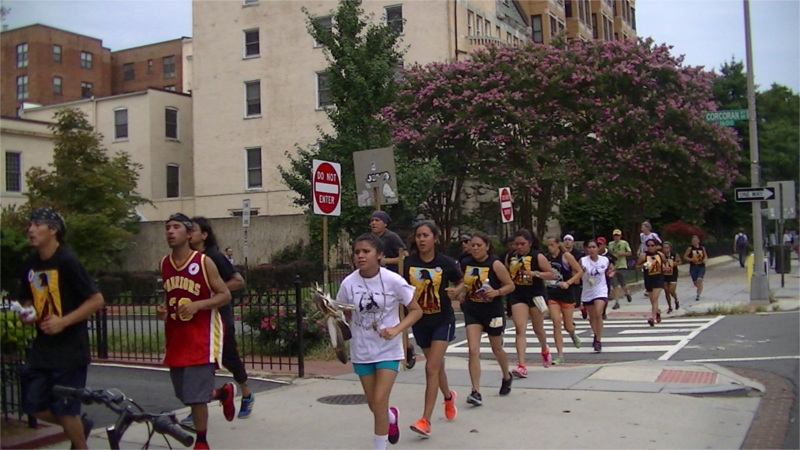 This two-day series of events began with a sacred run from the north ariving down 16th Street at the White House. There they joined a second contingent of Apache and supporters waiting for them, held a rally at the White House and marched to the US Capitol to hold traditional ceremonies there. Apache Stronghold is here to support HR-2811, the Save Oak Flat Act, which would undo permission given to Resolution Mining LLC and Rio Tinto to mine copper on Apache land given to them in by Sen John McCain and reps Representatives Kirkpatrick and Gosar of Arizona. Museum Square at 4th and K sts NW is one of the last affordable housing projects in Chinatown, containing nearly half the remaining Chinese community there plus many African-American residents. The owner of the building (Bush Properties in Va) wants to replace it with condos and luxury apartments for the rich. 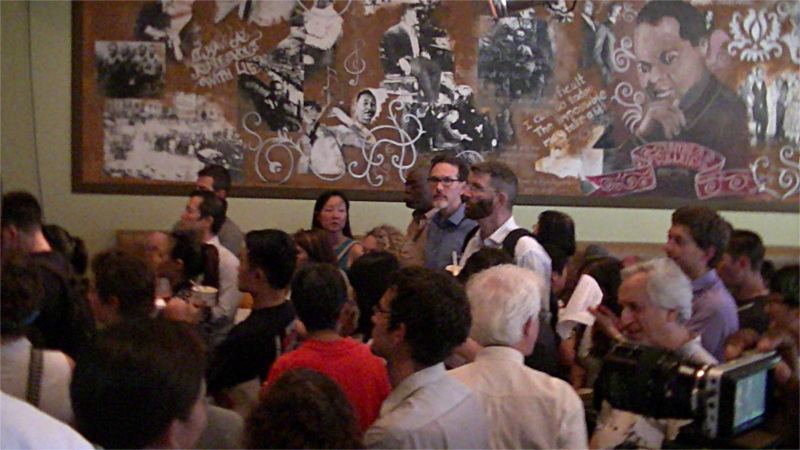 As part of the campaign to save the building and block the evictions, Busboys and Poets at nearby 5th and K st, held a party for Museum Square residents and supporters on July 20. The room was packed to standing room only. Not sure what the original problem was, but when this video was shot one problem was that there were too many cops! And only one young guy documenting it on his cell phone. By the end of the last video, there were fewer cops, and more people recording with their phones.